Share your love of Trinity Trail and Lake Lavon by introducing a friend to the trail. Bring a non-TTPA member to enjoy a delicious breakfast and a fun ride or hike afterwards. Door prizes will be given out. Bring your horse’s coggins and a chair. Lucas is northeast of Dallas, TX. From Dallas, go north on US 75 to the Bethany Drive exit in Allen and go east. Take Bethany Drive through Allen into Lucas (about 5 miles). Counting the light at the expressway exit, you will go through nine lights. The ninth light is at Bethany and FM 1378 where Lucas City Hall will be on the left. Go straight. In about ½ mile, when the road makes a sharp curve, you will see a stoplight and the Lucas Food Mart and gas station will be on your left. Turn left here on FM 3286 and go less than a mile to Brockdale Park Road. There is a brown Brockdale Park sign on the right just before the turn. It turns off to the right. If you get to the bridge over Lake Lavon you have gone too far. Follow Brockdale Park Road around to the trail head. You will drive through three 90-degree turns. The trail head is at the 3rd 90-degree turn on the right and is bordered by white pipe fence. If you get to the boat ramp you have gone too far. TTPA will be hosting our annual dinner and Christmas party on Friday, December 6, 2013 at 7pm. The party this year will be a catered buffet dinner at the Collin College Spring Creek Campus Conference Hall (2800 E. Spring Creek Parkway). We’ll be recognizing volunteer contributions, Volunteer of the Year, and some other new Awards. We’ll also be auctioning off two of the legacy Trinity Trail hat pins, followed by our popular Gift Exchange. When – Friday, Dec 6, doors open at 630pm, buffet opens sometime after 7pm. Go To http://www.trinitytrailriders.org/11/ttpa-annual-dinner-december-6-2013/ for more info and a map. See you there! Should be a fun event!!!! is a very simple and fun way you can help. Dustin Perkins and Big Gus and Swampadelic. of the equestrian trail and other future projects benefiting equestrians. Alliance that the horse community wants to be involved in helping. and enjoy a great day. 380n News, Cabela’s and REI. TTPA is doing a new fundraiser this year, we are hosting a ACTHA ride at Brockdale Trailhead. ACTHA stands for the American Competitive Trail Horse Association and it is an organization that promotes trail riding. Organizations can host rides to get a percentage of the profits. There will actually be two back to back ACTHA rides at Brockdale the weekend of 26-27 May. The ride on Saturday is a fundraiser for Grace Lake Therapeutic Riding and the Sunday ride benefits TTPA. The ride will be three miles in length and have six obstacles. You can sign up for the ride at the ACTHA website at http://www.actha.us/home. It should be a fun event. Hope to see you there. 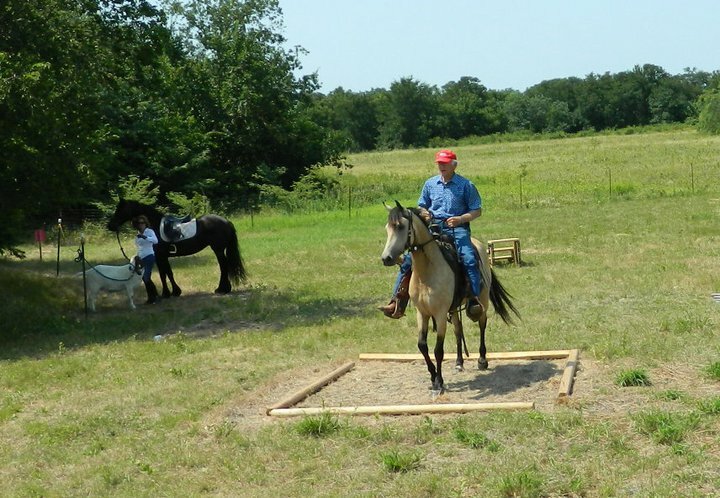 The Trinity Trail Preservation Association (TTPA) is sponsoring an Equestrian Obstacle Competition for fun on 17 Sept 2011 at the East Fork Trail head. Registration will open at 8 AM and close at 9:30 AM. No registrations will be accepted at 9:30 AM. A participants meeting will be held at 10:00 AM. See details and registration information on the TTPA main web site at Obstacle Course information. If you’ve never done an obstacle course with your horse before, you need to come out to Princeton this Saturday and join us at the Obstacle Course Fundraiser to benefit Grace Lake Therapeutic Horsemanship. This event promises to be fun for both you and your horse. This is not a competition, but a learning and training experience to enjoy with no pressure. 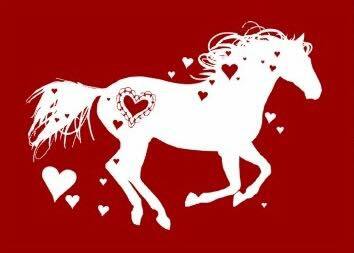 All donations are tax deductible and benefit Grace Lake Ministries a 501c3 that provides a Christ-centered NARHA therapeutic horsemanship program in the Anna/Blue Ridge area. Exit on Bethany Drive in Allen and go east. Take Bethany Drive through Allen into Lucas (about 5 miles). Continue straight through on Bethany Road, the road changes its name to East Lucas Road and intersects with FM 1378. Go through the traffic light straight on Lucas Road. In about ½ mile, when the road makes a sharp curve, you will see the Lucas Food Mart and Fina station on your left and a traffic light. Turn left here at stop light on FM 3286 (aka Lucas Road) . Go across two bridges and continue on Lucas Road until the road tees into F928. Turn left (north) and to until FM 3364 (there is a gas station on right corner). Turn right onto FM 3364 and go about 1/2 mile and you’ll see Cowboy Church of Collin County. This is the location of the obstacle course. Note: This is not an official TTPA event, but it is a horse event with many TTPA members attending. The TTPA Board has canceled the May 2011 Trail Ride. This decision was based on recommendations from the Texas Animal Health Commission (TAHC). Texas Animal Health Commission (TAHC) officials are continuing to trace exposed horses that attended the National Cutting Horse Association (NCHA) Western National Championships event that ended on May 8 in Ogden, Utah. There are currently 26 known horses in Texas that attended the event. Those 26 horses and a total of 323 more cohorts (stablemates) of the 26 are currently being held under movement restrictions across the state. The epidemiological investigation of all 300+ plus horses that reportedly attended the event continues nationwide, and the number of Texas horses identified as exposed may increase in the following days. Although mandatory cancellation of future events is not anticipated, the TAHC suggests that horse owners consider the risk of participating in upcoming events scheduled for this weekend and/or co-mingling their horses with other horses and equipment (trailers) of unknown history. Because the incubation period is usually about 4-6 days or less, even a one week voluntary stop movement may be enough to nip the cycle of transmission between horses before it grows in scope. Horse owners should contact event organizers in advance to ensure that scheduled events have not been canceled. Some other states have established emergency rules for entry as a result of this situation, so if interstate travel is planned, owners and/or veterinarians writing health certificates should check in advance to ensure they meet all entry requirements. Finally, it is recommended that all newly purchased horses or introduced horses to a premise should be isolated to help prevent the accidental introduction of EHV-1 (and other diseases) onto the premise. We will regroup and ride in June after the crisis has been contained. TTPA has two scheduled events for the month of May 2011. Bring water, clippers, and gloves. This is an informal trail ride with no organized lunch. After riding we plan to have a simple gathering to visit and eat sack lunches. Bring sack lunch, beverage, and a chair. Don’t forget the TTPA Trail Ride and Cookout this Saturday. 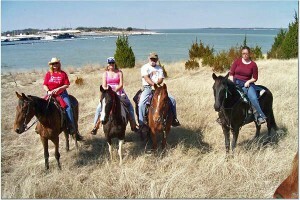 Join your fellow trail riders and TTPA friends for a trail ride and cookout on 23 April 2011. Shelley Van Duran will be treating the group to homemade hamburgers cooked over the fire pit, baked beans, chips, watermelon, and yummy cupcakes. Come out and enjoy the day. Arrive at Brockdale Trailhead in Lucas, TX at 9:30. Ride out at 10 AM. Lunch will be served at 1 PM. Come eat like the cowboys and join us for a relaxing time. Please RSVP to Lana Gilstrap at lanagilstrap@sbcglobal.net so we know how much food to make. There will be a $5 donation to cover drinks and paper goods. Lunch will be served at 1 PM after the ride. Join us for some great conversation with other riders. You can adjust your ride to your own schedule. The ride will be automatically cancelled if it is raining or if there has been so much rain as to make the trail extremely wet, muddy and dangerous. To check on trail conditions call Trail Steward Charlie Gaines at 972-824-3369. Don’t forget your current negative Coggins Certificate for each horse, as state law requires us to check. You can’t enter the park without one. For safety reasons, dogs will not be permitted on the trail. They must remain tied at your trailer in camp. Directions to Brockdale Park TrailheadLucas is northeast of Dallas, TX. From Dallas, go north on US 75 to the Bethany Drive exit in Allen and go east. Take Bethany Drive through Allen into Lucas (about 5 miles). Counting the light at the expressway exit, you will go through nine lights. The ninth light is at Bethany and FM 1378. Go straight. In about ½ mile, when the road makes a sharp curve, you will see a stoplight and the Lucas Food Mart and gas station will be on your left. Turn left here on FM 3286 (also called East Lucas Road) and go less than a mile to Brockdale Park Road. There is a brown Brockdale Park sign on the right just before the turn. It turns off to the right. If you get to the bridge over Lake Lavon you have gone too far. Follow Brockdale Park Road around to the trailhead. You will drive through three 90-degree turns. The trailhead is at the 3rd 90-degree turn on the right and is bordered by white pipe fence. If you get to the boat ramp you have gone too far. Come out and cheer on the 4-H kids in the Silver Saddle 4-H Classic show to be held in Collinsville TX on May 14th. Classes include Showmanship, Western Pleasure, Trail, and Western Horsemenaship. There is also a Reining jackpot for all ages. To register and detailed information go here. Once again our wonderful volunteer members have risen to the occasion. This past Saturday was a clean up work day at Brockdale and we were blessed with a number of wonderful volunteers. 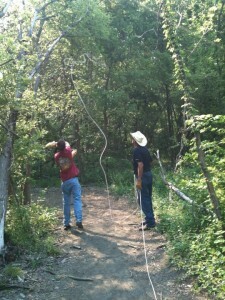 It is true that many hands make light work – especially when it comes to clearing dead trees off the trail. Thanks to everyone who helped. You made it better for all of us. Here’s a note from Jack Gilstrap who was one of the volunteers. We had a very productive workday thanks to Wade and Jamie Hanchar, Kaetlyn and Kris McFarland, Lucy Estabrook, Maureen Miller, Katie and Lizzy Rosdorff and Jack Gilstrap. We policed the trailhead and entry area for trash and debri. Wade, Jamie, Kaetlyn, Kris and I took the Gator on the trail to install new signs and take down several dead trees too close to the trail. This group earned the title “WRECKING CREW!” We cleared alot in a timely manner. Mission accomplished thanks to Great Volunteers. April Trail Ride Time is Here! 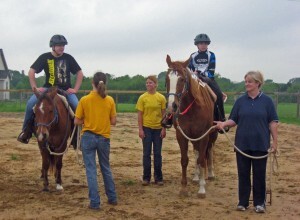 Join your fellow trail riders and TTPA friends for a trail ride and cookout on 23 April 2011. Lunch will be served at 1 PM. Kurt and Sheeley Van Doran have offered to once again treat the club to a dutch oven lunch. Come eat like the cowboys and join us for a relaxing time. Please join us to do work on the trail. Meet at Brockdale at 9 AM this Saturday 9 April to help install signs and pick up trash on the trail. Bring gloves and water to drink. Contact Charlie Gaines at 972-824-3369 for more information. The Trinity Trail Preservation Association (TTPA) will sponsor a trail ride and Dutch Oven Cookout, Saturday, 19 March 2011 at the Brockdale Park trailhead in Lucas, Texas, weather permitting. Trail Ride: Arrive trailhead at 9:30 AM. Ride out at 10 AM. Lunch: Dutch oven lunch scheduled for 1 PM. Once again Kurt and Shelley Van Doran have volunteered to treat TTPA riders to a delicious meal cooked authentically in a Dutch oven. This month the menu is homemade tacos, beans and a dessert. Please RSVP to Lana Gilstrap at lanagilstrap@sbcglobal.net so we can get a head count and know how much food to make. Lucas is northeast of Dallas, TX. From Dallas, go north on US 75 to the Bethany Drive exit in Allen and go east. Take Bethany Drive through Allen into Lucas (about 5 miles). Counting the light at the expressway exit, you will go through nine lights. The ninth light is at Bethany and FM 1378. Go straight. In about ½ mile, when the road makes a sharp curve, you will see a stoplight and the Lucas Food Mart and gas station will be on your left. Turn left here on FM 3286 (also called East Lucas Road) and go less than a mile to Brockdale Park Road. There is a brown Brockdale Park sign on the right just before the turn. It turns off to the right. If you get to the bridge over Lake Lavon you have gone too far. Follow Brockdale Park Road around to the trailhead. You will drive through three 90-degree turns. The trailhead is at the 3rd 90-degree turn on the right and is bordered by white pipe fence. If you get to the boat ramp you have gone too far. The Trinity Trail Preservation Association is an all-volunteer equestrian organization whose main purpose is to maintain the 25.5-mile long trail on the Corps of Engineers land along Lake Lavon and to network with other trail riders. Besides maintaining the trail, the group sponsors trail rides and cookouts and has quarterly meetings with speakers on horse-related issues. The group is truly regional and has nearly 200 member families from the nearby communities. The trail runs from Highland Park in the north through Brockdale Park in Lucas through Collin Park in St. Paul to East Fork Park in Wylie. For more information about TTPA, call Membership Chairman Ruth Blom at 214-418-4106 or see the Trinity Trail Preservation Association’s website (http://www.trinitytrailriders.org) , the TTPA blog (http://www.trinitytrailsblog.org/ or the TTPA Facebook page (http://www.facebook.com/pages/Trinity-Trail-Preservation-Association-TTPA-Texas-Trail-Riding/111429362218053).